Edelbrock‘s Rev’ved Up 4 Kids carshow and charity gala made it’s 8th annual presentation in as many years. The annual charity carshow was brought to life in 2006 after Edelbrock family member, Christi Edelbrock, recognized that educational institutions were struggling with providing for their pupils in an environment where the budgets were shrinking. Meeting with a small educational institution in the local area, the Center for Learning Unlimited, Christi talked to the center’s director, Virginia Mathews, where Christi decided to help with the Center’s fundraising. Edelbrock’s Gala charity event also launched the 75th anniversary of the company. Their first attempt to raise funds was through T-shirt sales. “I’ve never worked as hard in my life for a thousand bucks,” Christi recalls. “I knew there was a better way, and there was a whole automotive industry and culture of car enthusiasts that supported education,” she added. Thus was the genesis of the Rev’ved up 4 Kids carshow. That first year, Christi led a group of just 5 volunteers through the planning and logistics of the very first event that was attended by over a thousand people and more than 200 cars. This year’s event once again exceeded all expectations, and now nearly 300 people a year volunteer their time to make this show a success. This year’s Rev’ved Up 4 Kids carshow coverage and photo gallery can be viewed by clicking this link Rev’ved Up 4 Kids carshow. Over the past 7 years, Rev’ved Up 4 Kids has established itself as a one-of-a-kind charity event that is fun for the whole family and community. Rev’ved Up 4 Kids has continued to draw in cars of every variety including street rods, musclecars, classic cars, trucks, specialty vehicles, motorcycles, and private collections. Automotive legends like Ed Pink (back to camera), Ed Iskenderian (with hat) and Nick Arias talk about the good old days. Each year there have been added wrinkles to the event, which now includes a Charity Gala the evening before the carshow with free Edelbrock shop tours of Edelbrock’s corporate headquarters and manufacturing facilities in Torrance, California. This year’s shop tours was a chance to take a one of a kind guided tour through Edelbrock’s facilities and see what 75 years of dedication to performance products has built. The tours included a complete overview of everything from research and development to finished product manufacturing. This was a unique chance for automotive enthusiasts to get a sneak peek into what it takes to design and manufacture high-quality performance products. Shortly after the facility tours were completed, the festivities moved to Vic’s Garage on Madrid Avenue in Torrance, where the Charity Gala with some of the automotive performance markets’ biggest legends kicked the charity weekend into high gear. This gala fundraiser also launched Edelbrock’s 75th anniversary year in a way that only Hot Rod legends could… by telling tales and secrets of the years gone by. The 2013 version of the Rev’ved up 4 Kids charity weekend operated under the purview of the Edelbrock Family Foundation with guidance from event founder and longtime organizer, Christi Edelbrock. Filling in for the recovering Christi Edelbrock was the family matriarch, Nancy Edelbrock, seen here with Rod Authority host, Dennis Pittsenbarger. Christi Edelbrock has embraced the importance of educating today’s youth and is becoming a catalyst for change in the industry. By partnering with a variety of organizations including universities, cultural institutions, high schools, specialty learning institutions and after school programs, Christi has created a coalition that is dedicating to fostering an innovative environment for students to learn and develop – a far cry from the first charity event selling T-shirts for a thousand bucks. One of the most exciting programs that benefits from the Edelbrock Family Foundation is Ohio Technical College. Launching the Edelbrock Performance Academy almost two years ago, the program is designed to give students a solid foundation in the building and tuning of high performance Edelbrock products. Ohio Technical College’s 12-week, 300-hour course consists of nine different training modules covering intake manifolds and carburetor design, cams and lifters, cylinder heads, computer tuning, fuel injection, forced induction, nitrous oxide, data acquisition systems, as well as the history of Edelbrock and the Specialty Equipment Market Association (SEMA). The famous logo crafted with legos. Vic’s garage turned into a movie theater where the company’s story was told on the big screen. Vic’s garage houses some of the most amazing artifacts from the company, along with a collection of cars that is simply out of this world. Historic Edelbrock manifolds line the walls, one of a kind engines sit on engine stands, and trophies of every shape and size occupy shelves and stands. The walls are covered with pictures of Edelbrock’s past. From Vic Edelbrock Sr’s day at the helm and on the track, to racers and Edelbrock employees that contributed to legendary feats in shaping how the automotive performance industry did business. A visit to Vic’s garage is well worth the time. Every year during the Revved Up For Kids charity car show, Edelbrock opens up the museum to the public, free of charge. The cars in Vic’s garage are incredibly awesome, and we’ve covered them on several occasions, but it always takes extremely nice cars to bring out other exquisite custom and show cars. Such was the case on Sunday, May 5th, when the Revved Up For Kids car show began. In the Edelbrock parking lot on Madrid avenue, some of the most historic and unusual hot rods were placed in spots of honor. A special area was roped off for the Hot Rodders of Tomorrow and their Engine Challenge contest. 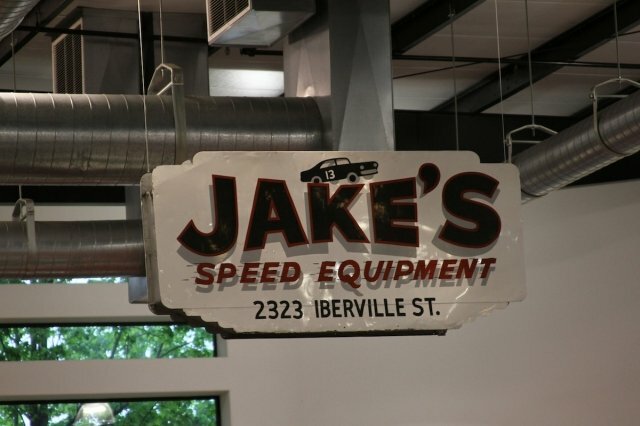 Jake’s Speed Shop was one of the first distributors to carry Edelbrock made parts. Every year Christi Edelbrock tells us that next year they have a bigger show planned with exciting new projects. Every year she comes through with one of the best Charity Automotive events in Southern California. Next year however, it’s going to be hard to beat this year’s annual Rev’ved up 4 Kids event combined with Edelbrock’s 75th Anniversary kick-off celebration, but we’ll just have to wait and see!